TRAFFIC SOLUTIONS are discussed among Christopher Rider of LADOT (standing) and Windsor Square neighbors. To Rider’s left are Rob Fisher and Sarah Dusseault of Councilman David Ryu’s office. Bike lanes are going to be added to several blocks of Van Ness Avenue to help reduce speeding. The move comes as a result of a joint meeting held in March among residents of Windsor Square’s Van Ness and Norton avenues, their Ridgewood-Wilton neighbors and city officials. 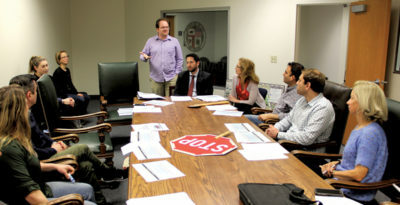 Convened by City Councilman David Ryu’s staff, the meeting at his Hollywood office featured a presentation from Christopher Rider, the Hollywood District Engineer with the city’s Dept. of Transportation (LADOT). Responding to questions put to him before the meeting by Ryu’s chief of staff, Sarah Dusseault, and deputies Rob Fisher and Catherine Landers, engineer Rider offered several suggestions for dealing with the traffic safety problems being encountered on a daily basis by residents. There was discussion about speed humps, and Rider and the neighbors in attendance agreed that speed humps are not a panacea. There are significant problems with speeding on wide Van Ness Avenue, north of Third Street. Rider described two ways to narrow perception of the street’s width — a goal because wide streets lead to some drivers choosing to speed. One approach is to reduce lane width by installing a center left-turn lane. The other approach is to stripe the road on each side with a bicycle lane between the travel lane and the curb parking. There was a consensus supporting this latter approach, with the Council staff and Rider agreeing that LADOT will add bike lanes on Van Ness between First and Third. On the narrower stretch of Van Ness north of First Street, LADOT will paint bicycle sharrow (“share the road”) markings. The other issue of concern to residents, especially those on Wilton and Ridgewood places, was what should be the type of flashing signal light at the intersection of Second Street and Wilton Place, just south of the Wilton curve. There are different opinions among residents and LADOT engineers. An ad hoc committee on both the Van Ness and Wilton issues, to be led by Matt Jacobs of Windsor Square and to include Mary Rajswing of Ridgewood-Wilton, will continue to work with Councilman Ryu’s staff and the LADOT engineers on these matters.